Canadians are blessed with a terrific selection of golf and vacation destinations to consider for that perfect summer family experience. Our unique landscapes offer spectacular mountains, captivating oceans, and everything in between. With no shortage of great locales to choose from, this stunning and charming area in the Laurentian Mountains of Quebec will provide you with all that you are wanting and then some. Mother Nature has created a masterpiece in Mont Tremblant. The area is a blend of steep escarpments and large rises, dotted with numerous lakes and rivers. It can best be described as a more rugged, dramatic, and elevated Muskoka. Vast forests and wetlands make this area a nature lover’s paradise and a perfect location for the array of outdoor activities that will satisfy even the most demanding adventurer. Most people associate Mont Tremblant with winter and skiing. Possessing the largest vertical drop in eastern North America, Mont Tremblant has become a skiing Mecca for guests world-wide. What many don’t know is that Mont Tremblant is as much a summer destination as a winter wonderland. With the “trembling mountain” as the centerpiece of the burgeoning tourist center, the City of Mont Tremblant has taken what it was given and done a beautiful job creating a people friendly paradise that showcases nature’s splendour, while offering something for everyone. Within this city of approximately 10 000, the resident and guest alike, will discover nature at its finest, blended with just the right mix of cultured civilization. 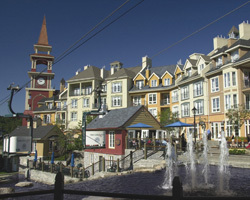 Three primary urban areas; Tremblant Village, Tremblant Resort and St. Jovite are all connected by transit, and recreational trails. Walking, skiing and bike trails link these areas as much as the car does. Between these quaint, charming urban areas, lie 6 golf courses, including 4 superb championship courses, which sees three of these consistently ranking among the nation’s best layouts. When considering the vast selection of vacation and golf locations around our great links nation, choosing one that offers you that unique experience can be difficult. Each offers something different, whether it be the landscape, layout or lore. What makes Tremblant unlike any other golf destination in Canada is not only a fantastic array of courses, but the atmosphere of the cultural experience as well. The architecture, language, food, music and most of all charm, give the visitor a European style vacation without the Trans-Atlantic airfare and customs issues. The French-Canadian ambience during a walk through the shops, a coffee at one of the numerous street-side cafes or a romantic meal at one of many dining choices all compliment the fantastic golf to provide something no where else in Canada can. 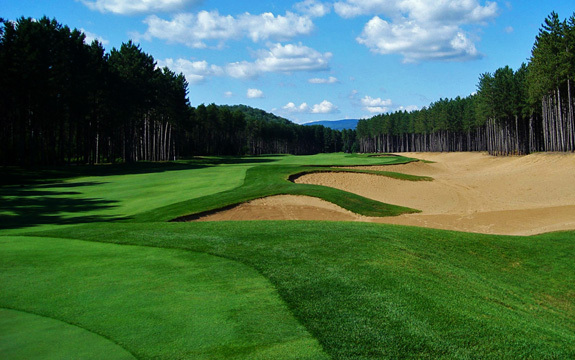 Gray Rocks: The original Tremblant golf facility now has two distinct experiences. La Belle – “The Beauty,” Gray Rocks’ first course dating back to 1920 boasts being the original course in the Laurentians. It has that traditional feel of golf in a different era with tree lined fairways, sharp elevation changes and small tricky greens. Golf Director Guy Oiumet and his staff have a course he is proud to call the “local’s course.” Oiumet is continually looking to improve this challenging layout and make it playable for both guests and members. This year he has added a set of junior tees and enhanced the forward tees for his membership and the golfing beginner, to make the experience more enjoyable. Between the tranquility, the views and the challenge of the golf, La Belle is indeed a beauty, with a bit of an edge to her. La Bete – “The Beast”, is Gray Rocks contribution to high-end, championship golf in the area. Graham Cooke and Darrel Huxham present the golfer with a strategic test of shot making, while routing you through steep valleys, vast wetlands and dense forests. The Diable River is used as a backdrop on numerous holes. Accurate approaches are rewarded by the tricky undulating greens. Pay attention to your distances on both number two and nine, as these fairways are stepped and leave little room for error. The back nine has a real bite to it, with three lengthy par 5s and three challenging par 3s, score early on the front, as there are not many low numbers found on this stretch of holes. 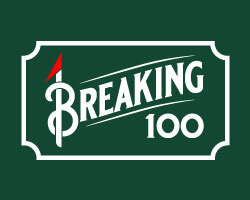 A wonderful test has been crafted with lengths from 4995 to 6840 yards and a rating of 73 sloped at 131 from the back decks, allowing for golfers of all levels to enjoy the pleasure and the pain of La Bete. Both courses have power and pull carts as well as helpful courteous staffs. A driving range/teaching area with practice holes is available to guests. Junior programs and great stay and play packages are available. Play both courses for 2 very different golf experiences, you will be thrilled you did. 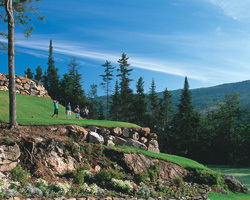 Golf Tremblant: Resort golf at its finest. Intrawest has created a facility that might be the envy of the Canadian golf industry. With 2 spectacular courses; Le Geant and Le Diable; both consistently ranking with the nation’s best layouts, it is hard to think of a place better suited to the golf enthusiast. In addition to the award winning courses is the magnificent Golf Academie. Golf Professional Scott Casey feels Tremblant has built one of the foremost teaching facilities in the country. Many golfers come back year after year to refine their game with the knowledgeable, professional staff assembled. The range allows for both, a warm-up prior to your round or individualized and group instruction with sheltered mats or grass tee decks. Multiple chipping greens and bunkers are designed to allow for a range of distances and provide a challenge to golfers of all levels. Club fitting and video analysis is also available for the dedicated student. Le Geant – The original “Golf Tremblant” course, gives the feel of playing on the mountain. Thomas McBroom, typical to his design style, uses rock faces, elevation change and strategic bunkering to test your game. Measuring from 5115 / 6836, Le Geant forces the golfer to be controlled off the tee, and puts a premium on the approach to the well protected, tricky green-sites. Many of the approaches require you to factor in the dramatic drops or substantial rises to the pin placements. Number eighteen is as good as a finishing hole gets. Played at dusk, the downhill approach with the stunning backdrop of Lac Tremblant will be a sunset you will never forget. Le Diable – Named after the turbulent river running through this area, this course hosted the 1999 Skins game won by Mike Weir. Massive waste bunkers and abundant water hazards cut through the hardwood and red pine forests and compliment the generous fairways and large sloped greens. Holes six and 15 are downhill beauties. The dramatic elevation change and remarkable views make hitting your tee-shot that much more of a challenge. This Hurdzen-Frey design playing 4651 / 7056 with a par of 71 is visually stunning and a stiff challenge of your abilities. For the golfing family, junior golfers play free with a paid adult after 4:00. Casey says this is a drawing feature for families looking to spend a glorious day together on either of the courses. The twilight rates are an incredible value and the service is top-notch. For those staying at the resort, include both of these golf experiences with any activity package you book on your stay. Golf Tremblant is truly a golf destination that can’t be missed. La Maitre: The New Kid on the Block. 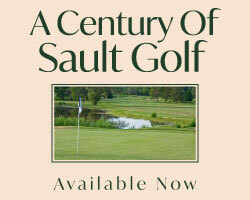 Clublink has built the latest addition to high-end golf facilities of the area. Le Maitre is a Fred Couples signature design, and lives up to all the accolades bestowed upon it. The routing takes you through a variety of landscapes. Lakes, hills, forests and wetlands with vast bunkers challenge both your tee-shots and approaches. The greens are firm and quick, with large ridges and slopes, making a 3 or 4 putt a reality if you are in the wrong spot. Tee-decks range from 5310 / 7010 with a slope of 131 from the back tees, make for an enjoyable test of shot making, or a formidable test of all you have in the bag. Be sure to celebrate the splendour of La Maitre with a visit to clubhouse patio. The vista overlooking 18 with a cascading waterfall is spectacular. This layout is a must play for anyone visiting the area. For over 100 years the “Grande Dame” has been hosting guests in this region. Gray Rocks, a four star accredited resort by Tourism Quebec, offers a wide range of reasons to stay here regardless of the season. With 1 of the 200 rooms and condos located on beautiful Lac Oiumet, you can have a day at the private beach or enjoy one of the many of the watersports available. Perhaps a hike or some horseback riding on the resort’s trails is more your style. Those looking for romance and pampering can find that at the indoor pool and whirlpools or with a visit to the “Oceanospa,” followed by a gourmet meal in one of the many dining choices. The resort’s 22 Har-Tru tennis courts make Gray Rocks the largest outdoor tennis facility in the country. Lessons and clinics are offered at the facility. A big priority at Gray Rocks is their commitment to kids. They have a wonderful package of activities available for the youngsters in the family, including a full day tennis (a.m.) and golf (p.m.) camp. Lessons from certified instructors mixed with the opportunity to get on the court and the course and play is a fun-filled experience for any child. Better known for its world-class skiing, Intrawest’s Tremblant Resort is also a fantastic four-season get-away destination for families and couples alike. Located at the base of the mountain, the charming pedestrian village is a bustling activity and cultural center. The village is visually stunning; a wonderful mix of restored buildings from the original resort and modern development modelled after Old-Town Quebec City gives the visitor a European alpine feel. The collection of specialty boutiques and the 38 restaurants provides countless unique shopping and dining opportunities. While staying in one of the village’s 1900 hotel, condo or residence units, you will not be without plenty to do and see. Besides the superb selection of golf courses, Tremblant has a selection of activities that rival any amusement park. Customized activity packages can be purchased in the village or as part of your accommodation booking. Whether your preference is a leisurely bike ride, a swim at the beach, mini-golf, a trip to the AquaPark, a breathtaking ride up the mountain to take in the magnificent vistas and Bird of Prey show, a wild street luge ride down the mountain or a rafting adventure to get your heart racing, this place has something for everyone. Currently under construction is a massive casino and hotel complex that will form the foundation of a new village, linked to the original with a high-speed gondola ride around the mountain. The village also hosts a variety of cultural events that draw thousands here. The Tremblant Film Festival brings together movie lovers and the industry for an indoor and outdoor film spectacle. Tremblant’s International Blues Festival brings in performers from around the world for a 10 day musical celebration. The indoor and outdoor stages come alive with a series of free concerts that will be sure to entertain. As well each weekend throughout the summer sees the stages in the village alive with themed concerts in Les Rythmes Tremblant.